The advent of a new book from Thames and Hudson is always something to look forward to and when the author is the esteemed Barry Kemp and the subject is about the Amarna Period then this is a very special publication indeed. This book does not disappoint, with 320 pages and 287 illustrations, 53 of which are in colour. After thirty years of excavation at Akhetaten, Barry Kemp has produced a detailed, and perhaps definitive, report on the city of Amarna and its inhabitants. 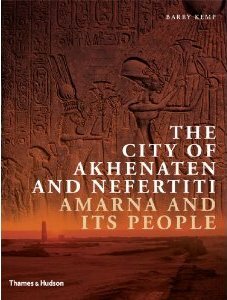 The city Akhenaten built as his new capital for Egypt, more commonly known by its modern Arabic name of Amarna, will be familiar to many of our readers, but this new publication offers the chance to revise all you thought you knew about the city, its temples, buildings, artwork and inhabitants. Almost every page of the publication is brimming with new information and detailed plans and diagrams. Kemp’s writing is often challenging and original and this volume is no exception as the author offers his own interpretation of the period and the discoveries accrued in thirty years of excavation. Chapters deal with Akhenaten’s vision for the city, its layout and his religious reform; the agricultural resources available to the city, and the building materials that could be used for its construction. The many temples found throughout the city are considered in depth, as are the royal apartments, palaces, villas, offices, housing and the ‘Workman's Village’. Based on the domestic architecture and the items found at the site, Kemp tries to reconstruct how people would have lived within the city and what their daily would have been like. Noise and smells are something which would have pervaded the entire city and the author does an excellent job of reminding us what life in a busy city would really have been like. The author also looks at religious beliefs in Amarna and how death would have been treated in a cult that had abolished the rites of Osiris, and a familiar afterlife in his underground realm. My only real criticism is that the index print is too small to read easily, but other than that the book is well worth purchasing it you want to learn more about the Amarna Period. This little book (19 x 19cm ) certainly catches the eye with its beautiful photographs, but one wonders at whom it is aimed. The text states that it “explores the ideals and realities of kingship in ancient Egypt, from the earliest rulers ... to the Roman Emperors”. Yet, at only ninety-six pages it can offer little more than a tantalising glimpse into the majesty of the pharaohs, their wealth, position and power. The author tries to accomplish her aim by dividing the book thematically into a series of five articles, each given engaging titles such as ‘Son of the Sun God’, and ‘Lord of Eternity’. 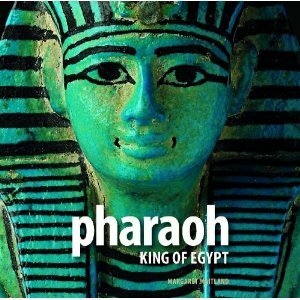 The format, therefore, gives scope for a discussion of the different aspects and roles the pharaoh has to play as ruler of Egypt. Designed to be a tie-in with the touring Exhibition “Pharaoh: King of Egypt” at first glance it appears to be little more than a souvenir picture book for the interested layman to peruse, but despite the obligatory map of Egypt, stock photos, and basic chronology, the text is not only surprisingly detailed but very informative. The choice of illustrations is, however, a little confusing, each one beautiful in its own right, but all slightly disorientating in their placement in the book. In short a very ambitious attempt in a souvenir booklet to convey far more information than was actually needed by the general visitor. Lesley Jackson took early retirement from the IT industry and now spends much of her time researching and writing about early religions and mythology. 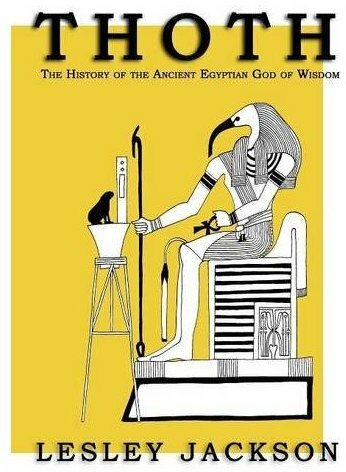 In this volume she presents a comprehensive study of Thoth or Dhwty [Djehuty], the ancient Egyptian god of wisdom, one of the better known of Egypt’s pantheon of deities. The Greeks knew him as Hermes, the Romans equated him with Mercury, but to Horemheb he was “the Beaky One”, and in one important Book of the Dead spell, Thoth was addressed as “O Nosey”! Separate chapters discuss Thoth’s symbolism and iconography, his lunar aspects, and the god’s role as judge, magician and healer, his association with wisdom, creation and the afterlife and his relationships with other gods. We discover that the baboon form of the god was created by Ra to form the moon so that people would not be afraid of the dark, and three goddess are associated with him (Maat, Seshat and Nehmataway) although virtually nothing is known to us about the relationship between them. Thoth’s more sinister side, is shown by some of the spells invoking his name: “May you strike down my male and female enemies, dead and living”. But while being wise and all knowing, the god was also seen as kind and protective: “He is of pleasing aspect, gentle, charming, loved by all”. The book concludes with the relevance today of the values associated with Thoth: literacy, justice, peacemaking, tolerance and harmony. 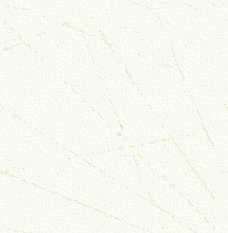 There are a couple of good hand-drawn illustrations, and a selection of hymns and prayers to Thoth are given as an appendix, along with a detailed bibliography. This is a well-researched and very readable work that will be enjoyed by the serious student or general reader and highlights the pivotal role played by Thoth over six thousand years of Egyptian history. This is another well-presented Thames & Hudson volume that will take its place alongside the well-established Clayton and Tyldesley Chronicles, this time putting the role of Pharaoh centre-stage and claiming to be the first book to explore what it was actually like to be king in ancient Egypt. Beginning with an introductory chapter covering the concept of pharaonic kingship, and a summary of dynastic history from 3100BC up to the end of the Late Period c. 332BC (the ‘Last Pharaohs’ are given their own chapter at the end of the book), we follow in the footsteps of Pharaoh. 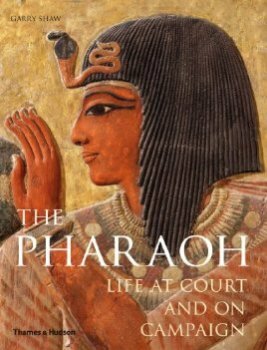 Themed chapters explore life as a royal heir, a pharaoh’s daily events and activities (including waking and dressing, morning audiences, rituals and festivals, banquets and sports), life on military campaign, the royal cities, and death and burial. Every action of the king, no matter how mundane, was an important ritual organised by high officials such as the “Overseer of every royal breakfast”. These men would preside over the daily ceremonies, beginning with a procession out of the royal bedroom to the private bathroom for a shower, followed by manicure, shaving, moisturising and anointing. There are some assumptions made, possibly to aid the flow of the narrative, for example that the queen who wrote to the Hittites asking for a prince to marry was Ankhesenamun, and that this prince was murdered en route, but elsewhere uncertainties are alluded to, as in the case of Tutankhamun’s death, which is “perhaps” the result of malaria and an infected leg. The final chapter ends with Diocletian, a discussion over whether or not he can be considered the last pharaoh, and how in spite of his persecution of the Christians, the Coptic calendar continues his regnal years to this day. A useful “Brief Lives” chronology at the end of the book is followed by chapter-by-chapter further reading suggestions; there are feature boxes throughout highlighting topics such as “Queens as Kings”, pyramid decoration and burial equipment, and plenty of colour photographs and illustrations. Overall this is a great introduction to the history of dynastic Egypt, explored through the life of Pharaoh, Lord of the Two Lands. Designer and architect Owen Jones (1809-1874) pioneered the study of the decoration of historical monuments, winning renown for his series of Fine Arts Courts for the Crystal Palace at Sydenham. 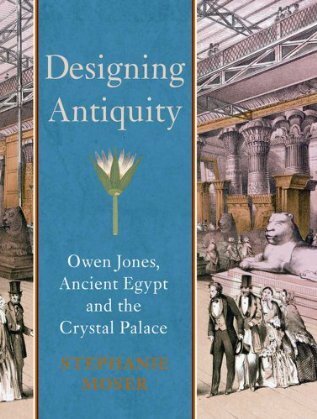 This book focuses on Jones’s Egyptian Court, which revolutionised the way Egyptian art was understood, beginning with an explanation of nineteenth century design and ancient Egypt as a source of inspiration for design and design reform. Moser describes a detailed tour of the Court, as seen through the eyes of Victorian visitors, including press reviews from the Illustrated London News and Punch, before looking at the court’s legacy and impact on academic thinking. She concludes that the exhibition, though an artificial commercial reconstruction, was a key event in the nineteenth century understanding of the past, inciting a new passion for the ancient world. The book includes many black-and-white and colourised photographs and illustrations of the exhibition, together with beautiful colourful plates showcasing Egyptian decorative ornamentation. With detailed references and notes, there is enough here for the serious student as well as the general reader.